I thought that I would share some of Hughes and Beatty’s ideas with you. They consider strategic leadership to be a holographic and therefore never-ending process that represents a way of looking at “the organisation-in-the-world”, and ways of acting in relation to “the organisation-in-the-world”. In my view, you and your team exemplify strategic leadership if you think, act and interact in ways that are deliberately focused on creating sustainable competitive advantage for your organisation. It differs from “ordinary” leadership in that (i) it has broad scope even when it takes place in a fairly narrowly-defined operational division of the organisation; (ii) its impact is felt over a long time in the life of the business; and (iii) it often involves the creation of significant organisational change both inside and outside the organisation. Strategic leaders are challenged to create focus in the business, to align tactics with strategy and to keep the long-term in mind despite short-term challenges. This is no small task given that the business environment requires increasing flexibility and resilience, while the internal “robustness” of the business demands increasingly complex, interdependent internal structures, systems and processes. It is the balancing of this tension that is the work of the strategic leader. 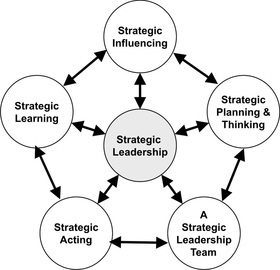 Strategic leaders understand that strategy is a learning process, rather than an event, and that effective strategic leadership involves a dynamic interplay between thinking strategically, acting strategically, building strategic relationships and influencing within those relationships with a view to the long-term, and constantly learning what we need to do to get there and how we might do it. Who are you (the business) and where do you want to go? What will you (personally and the business) need to learn in order to get there? If you are interested in reading more about strategic leadership I recommend “Becoming a Strategic Leader” by Richard L. Hughes and Katherine Colarelli Beatty (ISBN 0-7879-6867-6).